Dean and Ying's Blog - The Best Trash Room Treasure Yet!! A 26 inch LCD TV! The Best Trash Room Treasure Yet!! A 26 inch LCD TV! The other night I was taking out the trash and inside the trash room was an empty box for a brand new 37" LCD tv. And right next to that empty box was a 26" LCD TV. Needless to say, I didn't even bother asking Ying for permission to bring it home. (After bringing that cool hat home, she made a new rule that I have to ask her before bringing anything home from the trash room). I didn't skip a beat; I dropped my trash bag down the chute, turned around, leaned down and picked up the LCD TV with my right hand and opened the trash room door with my left hand and made my way home. Triumphant. GRUNT GRUNT GRUNT!! ME MAN. BRING HOME TV. GRUNT GRUNT! "Stoopid! It was probably broken," you say. Well yes, it was kind of broken. The picture turned on, but within a minute, the display got all staticky and weird. 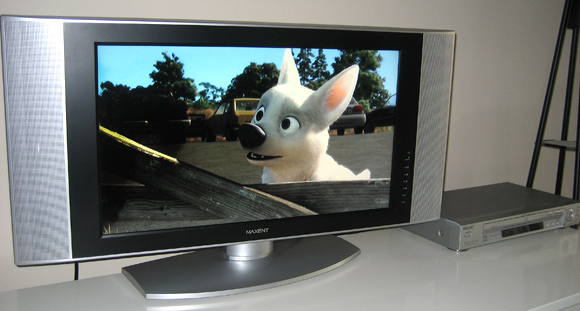 So off to the Internets I go to search for, "Maxent 26 inch LCD TV fuzzy picture" and what is this I see??? ----> Maxent MX-26X3 picture problem Wow! The very same problem reported by many people about the very same TV! Figures. But before trying the DIY method, I called Maxent to see if they would warranty the tv. I was going to just say, "I *ahem* got it as a ...uhhh... gift. Yeah, a gift!" But it turns out that the tv was manufactured back in April 2005 which means it's out of warranty anyway. A 4 year old tv going bad huh? Well according to that link above, I (nor the previous owner that threw this tv away) am not the only one with the problem. I asked their tech support how much it would cost to fix the tv with a bad heatsink... The support tech said, $90 examination fee, $150 materials for a new board (they weren't going to just fix the heatsink) and $90 labor for installing a bad board. He wanted almost $400 to fix this thing!!! Ok, time out-- YOUR company makes tvs that die in 4 years and you want someone to shell out $400 to fix it? You do realize that a new 37" TV costs about that much these days?.... What kind of company policy is this? Ok, so I got it from the trash, but what about everyone else stuck with a non working tv? I won't bother looking at Maxent the next time we go shopping for a TV. Here's a picture of it turned on -- great colors! Here is a bigger picture of it sitting on our bedroom dresser. 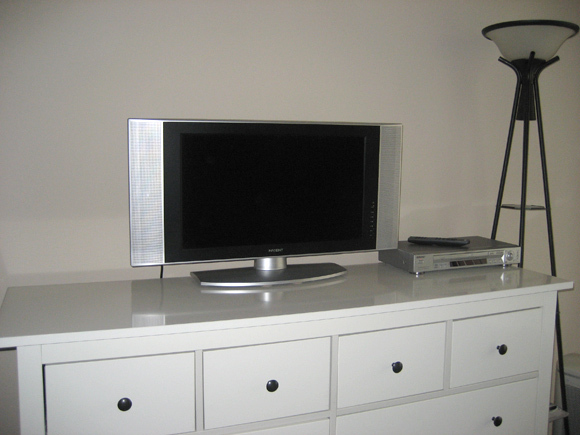 It has replaced an old 20" tube tv that we had there. Talk about major score! Say what you want about taking stuff home from the trash... I'm already ahead by a TV! Ying asked me, "Why would anyone throw away a tv if it's so easy to fix?" Here are my thoughts about the person who threw it away. 1. They purposely left it right inside the door of the trash room, which meant they knew someone would take it home. Very nice of them. and 4. They weren't comfortable around high voltage electronics. I think they were all valid reasons for leaving the TV in the trash room. After all, look; it ended up in a good home!